Mathematics teaching at secondary levels has proven surprisingly resistant to change over the past century. 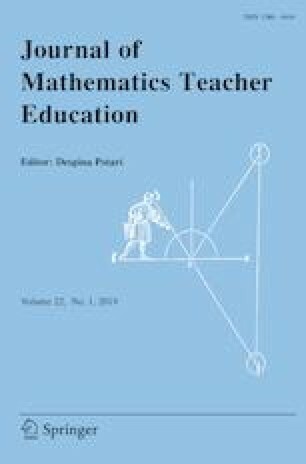 This study draws on two theoretical models to investigate how the process of changing secondary teaching in algebra through school-based professional learning might occur, and its relationship to different external and internal influences on teachers and researchers. A cyclic change model is used to discuss three different change pathways that were found amongst six practising secondary teachers participating in an algebra teaching experiment, one phase of a larger design-based research project. Meta-didactical transposition is used to examine the dynamics between teachers and researchers and the institutional dimension of professional learning. Affordances and constraints related to the teachers’ internal domains and social contexts in responding to professional learning opportunities are discussed. The bidirectional nature of brokering processes between teachers and researchers during professional learning is examined. What was the highlight for you in observing your students’ learning of algebra during this teaching experiment? What was the greatest conceptual difficulty for your students? Did anything surprise you in relation to their responses or learning? How did you find assessing your students’ learning (during lessons, looking at their written work afterwards, discussing with colleagues)? What is the single greatest thing you have learned from this teaching experiment about algebra? Has participation in the teaching experiment changed your perceptions or knowledge or future teaching practice in the area of algebra? If yes, what specific aspects have changed? How did you find the meetings with other teachers in the experiment? Is there anything you might consider doing differently in your teaching of algebra as a result of participation in this teaching experiment in Year 7? Is there anything you might consider doing differently in your mathematics teaching practice generally? What advice would you give to another teacher who is about to teach Year 7 algebra for the first time? Are there any other issues, suggestions or information you would like to mention? External domain The teachers were provided with external sources of information, stimulus, and support in the form of: professional reading; a series of exemplary student tasks and materials as documented in the research literature, including a student pre- and post-questionnaire; initial discussion of the tasks and the key concepts developed in each of them; concrete materials for use in lessons; the opportunity to co-teach with a researcher (author); and iterative facilitated discussions with other teacher participants. A learning progression for assessing students’ responses to the algebra tasks (Wilkie 2014; adapted from Markworth 2010) was provided to teachers as a specific theoretical tool (Robutti et al. 2016) to guide discussions of student learning and subsequent lesson preparation. Domain of practice The teachers had the opportunity to experiment in class with a series of five tasks incorporated in their existing unit on algebra; they could choose the option of including the researcher (author) as a co-teacher or observer during one of the five lessons according to their own preference. This domain encompasses change in all forms of professional experimentation, not just classroom experimentation (Clarke and Hollingsworth 2002) and so the teachers’ use of student pre- and post-questionnaires for trialling new formative and summative assessment strategies is also included here. Personal domain The teachers had opportunity to reflect on their initial knowledge, beliefs, and attitudes in a pre-questionnaire and were asked to explore changes to these in a post-questionnaire, debriefs with the researcher and other teachers, and final group and individual interviews. The researcher (author) also inferred and interpreted changes to knowledge, beliefs, or attitudes from observations of the teachers’ engagement, actions, and responses in the classroom and with each other. Domain of consequence In their final individual interviews, the teachers were invited to reflect on their involvement in the teaching experiment. Outcomes (positive and negative) were considered as salient to each teacher individually, and changes in each teacher’s domain of consequence were also analysed and interpreted through comparison of their pre- and post-questionnaires and from recordings of team meetings.